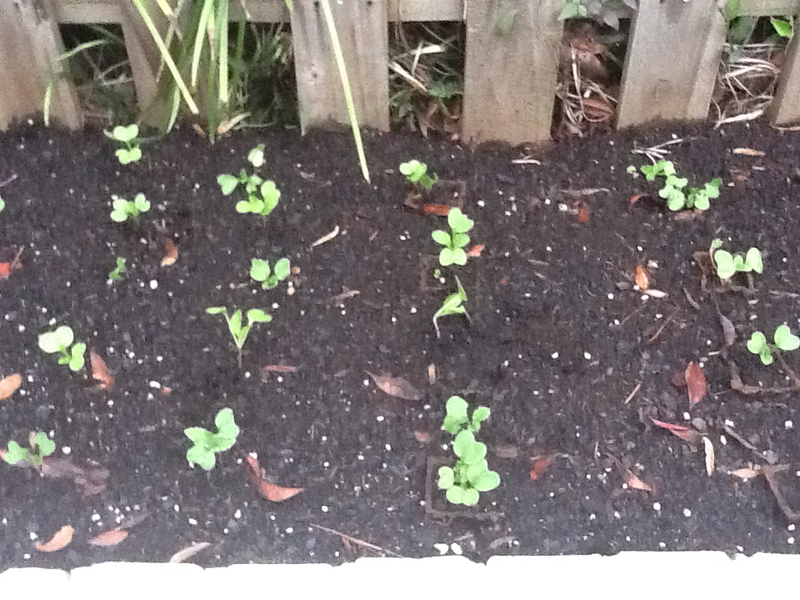 This morning before driving to work, I thinned out the radishes, again. Several weeks ago, I started the seeds in small fibrous cells, letting them sprout in the house–on a tray and under a thin plastic sheet. Once they were ready, I moved the seedlings outside to our wall garden. More than once now, I have thinned them, so that just one plant grows in its own space. Last summer, when we had less garden space, I discarded the thinned seedlings. Now, with the newly prepared larger space, as I pull out and separate tiny strands of radish plants, I can walk them a few feet to my left–to open ground. I enjoyed realizing that I did not have to waste these tiny plants. They have potential to grow into full, pinkish red bulbs that eventually we can rinse, slice and eat. Moving the slender plants this morning made me think of today’s school schedule. The spring vacation starts after today, and, as in many schools, we struggle to make the day worthwhile. We try to spend our time together productively, without wasting it. I have occasionally told students that as I age, I become less interested in wasting time. So today, in my sophomore classes, we did an exercise I had been imagining for some time, not sure when or how I would implement it. I will briefly describe it, along with a few fun discoveries. As newly appointed interns in the US State Department, prepare a map (with four basic features) of the Dominican Republic for Secretary Clinton and the rest of her staff. I can send you, readers of this blog, the one-page instructions, if you like. For now, just know that we had just finished reading Julia Alvarez’s In the Time of the Butterflies, set in the DR during Trujillo’s oppressive thirty-year rule. 1. As with most such exercises, the main challenge, especially the day before vacation, was to engage all group members in the map-making process. 2. As groups worked, I monitored progress with Photo Booth, an application on our MacBooks that let me film interactions in each group. During the last five minutes, when I projected the video for everyone, I began to see this filming as a fun, natural way for the students and me to assess varying levels of collaboration within groups. Also, I have a new tool for my assessing the kinds of questions they ask, and just as important, how I answer those questions. Among today’s discoveries, this one excites me the most–partly because I have started reading a book about student questions and partly because I see a natural way to mix student engagement, technological tools and my own self-assessment. The book, incidentally, is called Make Just One Change: Teach Students to Ask Their Own Questions and written by Rothstein and Santana (Harvard Education Press, 2011). 3. The wording of the assignment’s instructions, appearing below a copy of the State Department’s official seal, gave me license to inject a realistic feel to my interactions with the students. In my role as Special Assistant to Secretary Clinton, I could make sure they understood the need to work efficiently together. State Department staff members often need to work on short notice. They need to find, understand and communicate information with efficient collaboration. I like to think that today, when some wish they could waste time, we had fun playing roles and learning more about another country. As one of the team leaders was packing her backpack, she explained where the country’s two major airports are. Out of genuine safety concerns, this student wanted to make sure that Secretary Clinton landed in an appropriate location. You will have to believe me that this girl, on the day before spring break, sounded as if she had suspended her disbelief. Her imagination had taken her authentically into this assignment. What a joy it was for me to hear her speak in this tone, in these terms. We took one person’s potential and planted it in fresh soil. I read the last line as ironic. Me, too. He takes great advantage of the time by noticing the golden stones. He sees them and the other sensations as opportunities to savor that some people discard. To waste these opportunities is to waste life.